This design is brought to you by our Artist of the Month. Alksdeef is a good friend of FFee and a talented artist, and I am sure that you will see some more designs by him in the future. Be sure to check out his website at alksdeef.com, and if you would like to get in contact with him send an email to info@alksdeef.com. Its going to be out real soon. 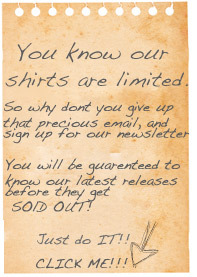 So make sure you sign up for the Newsletter to hear about it before they are sold out!